Discworld is a world and a mirror of worlds. This is not a book about Australia. No, it’s about somewhere entirely different which just happens to be, here and there, a bit…Australian. Still…no worries, right? Tonight is a very exciting night. Stephanie and I are travelling down to Sydney to see Terry Pratchett speak at the Sydney Opera House. In fact we are about to leave in the next twenty minutes. So here’s the deal. This is going to be an abridged review. I am posting my initial impressions of the book and then this evening, when we eventually arrive home, I will throw up some more of a review, as well as some thoughts on the talk itself. First off, this is a Rincewind book. 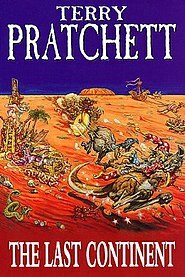 My very first Pratchett novel featured Rincewind and each title has continued that initial Fritz Leiber-esque fantasy pastiche of The Colour of Magic. These Pratchett novels are vaguer than the Ankh-Morpork novels, filled with the exciting stuff of pure Pratchettian imagination (is that a word?….it is now). The book opens with the wizards of the Unseen University concerned over the state of the Librarian. Originally an ordinary wizard transformed by a random magical event into an orangutan (one that happened to involve Rincewind) and who has since come quite to like being a hairy biped, thank you very much. Unfortunately the magical morphic field of the Librarian is in flux and he is being transformed into sundry other shapes and objects. The wizards decide the best solution is to find Rincewind, who might be able to help them stabilise the Librarian by providing them with his original name – unfortunately he is far away on the land of Ecks-Ecks-Ecks-Ecks. Rincewind himself has somehow managed to survive the typical (and oddly Australianish) flora and fauna. In fact he continuously finds water and something seems to be protecting him from any harm. Could he be destined to save the land of Ecks-Ecks-Ecks-Ecks? And what does a god who believes in Evolution have to do with this? Later folks – ride is here! The moment when you realise you’ve drifted away from the safe shore is terrifying and truly liberating in its brutal extreme. It suddenly hits you: you’re on a motorbike with every single thing you own in boxes on the back, and you don’t know where you’re going to sleep that night or where you’re going to eat or where you’re going to get fuel. You don’t know who you’re going to call if you break down; every kilometre you cover takes you one stroke deeper into the unknown. This is a fascinating story about a young man and his own encounter with the Australian Department of Immigration – who in the face of the fast approaching elapse of his work visa was convinced to travel across the outback, sail to East Timor and from there motor along across Asia, the Russian steppe and Europe. Happily I see from his website that he’s back in Sydney. In fact he’ll be signing copies of his book in Dymocks, on George’s Street tomorrow at 6pm. I would love to get my copy autographed, but erm, this is actually a library book. ‘cough’. Our hero Nathan was actually encouraged in his mad scheme by his Canadian girlfriend Mandy. Perhaps she made the suggestion because she thought it fit his free-wheeling nature, after all he had returned to Australia after his first stay purely in order to be with her (once again, I can relate). Switching the lady in his life from his girlfriend to ‘Dorothy’ the second-hand 105cc Honda Postie bike, Nathan sets off – but not before a random encounter with then-Prime Minister Kevin Rudd, who bemusedly signed his helmet. On his long, difficult road Nathan meets many like-minded adventurers and kind souls who help him along the way. He also has intimidating encounters with corrupt border guards, suffers bouts of paranoia from anti-malarial medication, witnesses extremes of human poverty and manages to wander into more than one site of civil conflict. The other journey faced by Nathan is his strained relationship with Mandy. 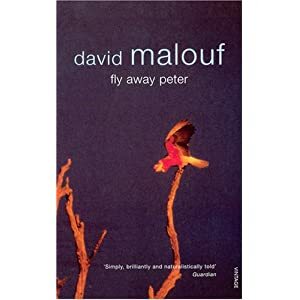 One of the book’s real strengths is its honest expression of emotional vulnerability, as well as its discretion – Nathan is at pains to point out that his girlfriend’s real name is not Mandy. It is a really affecting portrayal of a couple separated by circumstances beyond their control. With his trusty laptop allowing him to maintain email contact with a growing number of friends back home and around the world, Nathan’s story begins to gain more traction with the Australian media. A book deal with ABC manages to land exactly when he requires some additional funding on his mad tour of the globe. When I started reading this I quickly found myself becoming fascinated with this riveting tale. So much so I even got it into my head to include some snarky remarks in my review about how The Long Way Round mounted a similar expedition with security and a camera crew in tow. To Millward’s credit he respectfully acknowledges the efforts made by McGregor and Boorman, revealing himself to be quite a magnanimous soul. He is also a very entertaining guide on this sometime dangerous, sometime beautifully described trek through incredible landscapes. One aspect of the book I really enjoyed is how so many other people helped Millward on his journey. Joe from One Ten Motorcycles, the man who sold him Dorothy aka Dot, proved to be especially helpful, keeping in touch with his customer on his unusual quest, passing on advice whenever the Honda ran into trouble, even sending him spare parts via the post. I even found myself becoming a bit weepy when I came to the last stretch of the book. This must be one of those clichéd ’emotional journeys’, they talk so much about on book review shows. I also love how Millward refers to Dorothy and himself as ‘we’, which is both sweet and a poignant reminder of just how alone he was at times on the road. A wonderful story, filled with thrilling adventure, thought-provoking observations and a welcome depiction of human kindness. I grabbed a bit of posterity for myself, unwittingly, when some of the fans started running towards the stage and I did my bit at the microphone. ‘Hey! You in the black T-Shirt, slow down!’ Hundreds stopped in their tracks. Six years ago a friend of mine used to throw me some work checking concert tickets during the summer months. I needed the cash and it was a good way to see up and coming bands – as well as more established acts – for free. So at one of more popular music festivals I was at the head of a long queue of punters when I noticed a friend approaching at a rapid clip with a few mates. He had seen me and I could tell, was hoping that I would let him in gratis. Unfortunately for both of us I had a superior standing beside me with a scanning device designed to detect imitation concert tickets. Those who know me have often pointed out that I am rarely ‘in the moment’. So it was a surprising example of quick thinking on my part that caused me to turn to my superior just as my friend reached us and state “This man has no ticket”, then laugh in his shocked face, clap him on the shoulder and wave him and his party through. My superior took it as a joke and there were smiles all round. Michael Chugg has had a far broader career in the music industry than I. He is also just as upfront about various examples of skullduggery. It comes with the business. What distinguishes Chugg from many other movers and shakers in the industry is that he is a well-known icon within Australian music. More a force of nature, thanks to his career-long tendency to take to the stage when needed to harangue the more unruly elements of the audience, he is also responsible for bringing acts such as The Police, Bon Jovi and Pearl Jam to Australia. 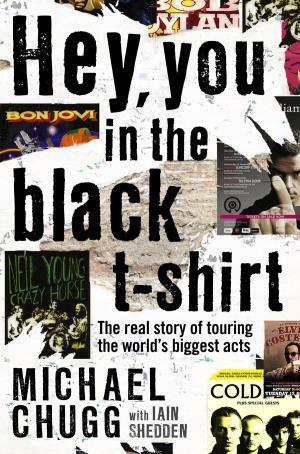 He was also devoted to helping Australian acts achieve more international reknown and throughout the book sings the praises of acts whether or not he ever got a chance to work with them, such as Crowded House, The Skyhooks and Billy Thorpe and The Aztecs. Chugg also expresses his frustration with the failure of acts such as Richard Clapton and Stevie Wright in foreign markets. On the personal side Chugg describes how his wheeler-dealer personality evolved from his working class background in Tasmania, attributing much of his behaviour, relationships difficulties and addiction issues to the earliest period of his life. It’s not many people who can claim they became a coke addict due to peer pressure from Fleetwood Mac. Successive marriages break down due to time spent on the road, plus the attendant temptations that accompanied touring. Rock bottom was a frequent destination, including spending time behind bars in a Californian jail. Eventually Chugg achieved a sense of peace in Phuket, although he continues to run his own entertainment company, utilising many of the connections he made throughout his long career. I first heard of Michael Chugg on the excellent Australian panel show Spicks and Specks. He related the same anecdote on air that opens the book – the absurdly decadent rider demanded by Fleetwood Mac on their tour. While it is clear that Chugg has an incredible reputation, it is a shame that his voice is not retained by his co-writer. One sentence in particular I found difficult. But for my powers of persuasion, he might have avoided the lengthy jail term that was to befall him. This book is less a kiss-and-tell in the time-honoured manner of You’ll Never Eat Lunch In This Town Again, than a chance for Chugg to settle some scores. His drug addiction is invariably justified as being due to others, or his control of it being cited as superior to that of other music industry figures, such as Stevie Wright, who would endure mental health issues. As he describes how his career with company Frontier starts to chafe, he begins to refer to them as the evil empire, complaining after he went independent that former colleagues were badmouthing him to clients. After all, he was now a business rival. His indignation makes little sense to me. One shining light in the narrative is his friendship with Aussie rocker Billy Thorpe, which is a relief in amongst all the negativity. I found reading this book bittersweet, which is a shame.